A long-time member of the Pine Tree Society team recounted a story of working with a young child who was considered nonverbal. As an experienced speech pathologist, she knew that little girl wanted to use verbal speech. After working with her for a period of time, she received the most amazing feedback from the child’s father. The young child, for the first time, said “I love you” to her parents. People with disabilities are used to hearing the word “can’t.” Pine Tree Society opens a new world to the people we serve. Whether it’s a child whose speech is impacted by cerebral palsy, a young adult with autism who wants a meaningful job or a young child who uses a wheelchair simply wanting to swing at the playground – we find a way to make it happen. We break down barriers. And we are able to do this thanks to your support. Discovering abilities together. It takes all of us. You play a critical role. You make stories like this a reality. The funding Pine Tree Society receives through reimbursement for services only covers a portion of our costs. Families caring for loved ones with disabilities have fewer and fewer resources to turn to for help. We need your help to fulfill the promise of our mission, a mission that has been in place for more than 80 years. Your donation will be put to work immediately to impact the lives of Maine children and adults with disabilities and their families through critical programs. We cannot do it without you. 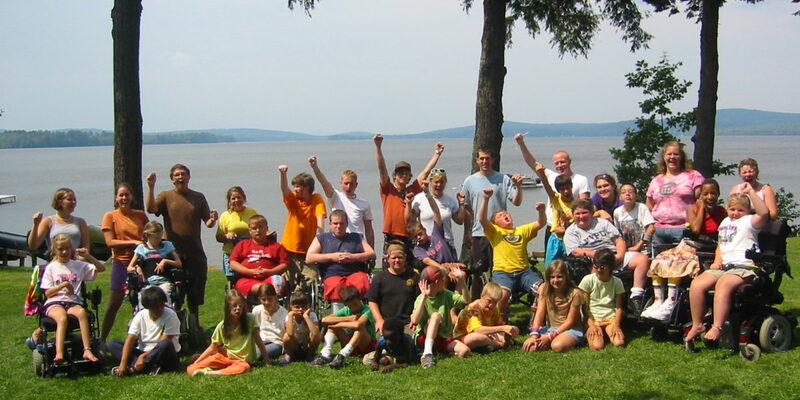 Together, we transform the lives of Maine children and adults with disabilities. Thank you. Thanks for getting in touch with us! We are so glad you are interested in Pine Tree Camp. Watch our website in early January because that is when the applications for the 2017 season will open up. We encourage you to get your application in early, before the slots fill up. Certain sessions fill very quickly. If you have any further questions, you can email our Camp Staff at ptcamp@pinetreesociety.org or give us a call at (207) 386-5990.